We had company for dinner the other night. Their daughter has some food allergies. Naturally, every dessert I looked at fixing for the evening was a “no go”. Then I remembered this one I yanked out of a Prevention Magazine that had come free in the mail years ago. I may have to spend some time on their website. I just went for the first time when I added the link. Looks like there might be some good stuff there, hmmm. 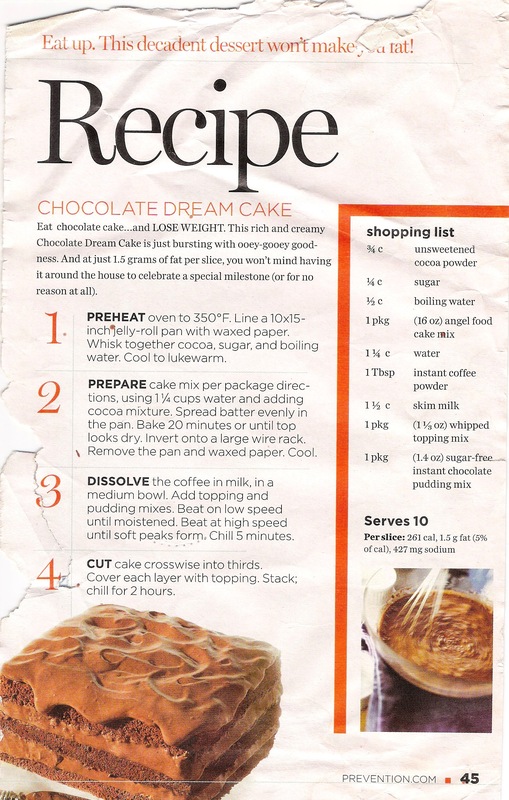 Please read all the ingredients and directions before starting this recipe. I glanced at it enough to jot the ingredients down and head to the store. Well, the second to last item on the list is whipped topping MIX. I bought a tub of Cool Whip!!! Crisis averted! I had a box of Dream Whip in the pantry. I almost never buy Dream Whip. However, there was a Kroger store that closed for remodeling and had a 75% off sale. Dream Whip was on the shelf, and I bought it for pennies. It keeps well on the shelf. Maybe I’ll have to keep some on hand from now on. Either that or read ingredients more carefully! 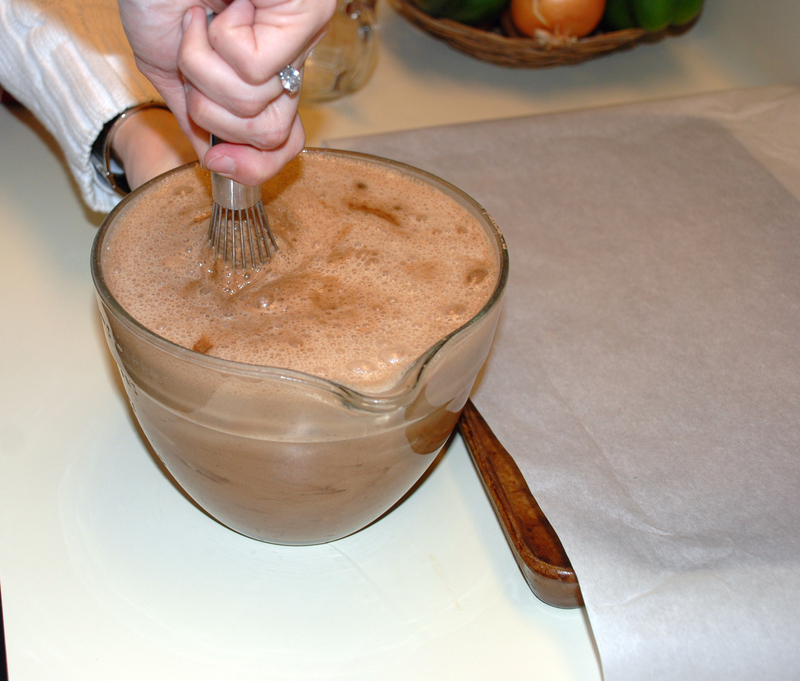 You also want to be sure that you DO NOT skip the first, well, second, instruction–line the pan with waxed paper! 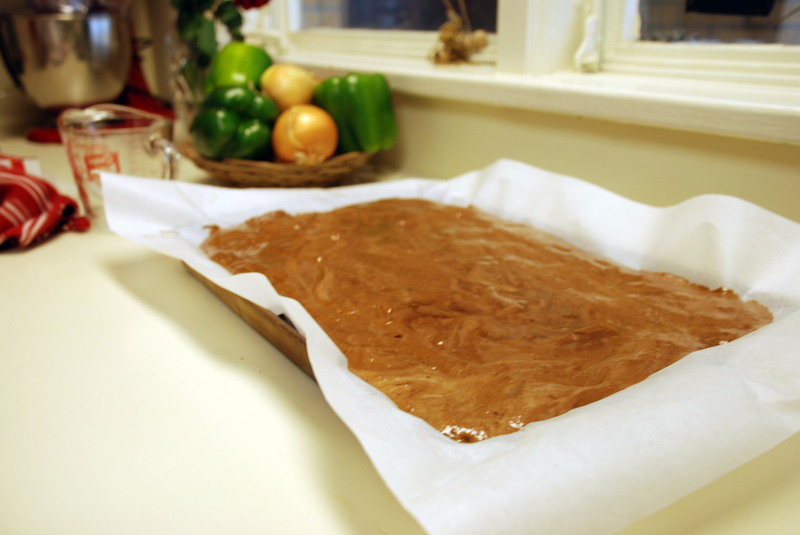 This I knew to do, although, I used parchment paper. If you don’t line the pan, it is very difficult to remove the cake!!! I used 2% milk and regular chocolate pudding rather than skim and sugar-free. I guess mine wasn’t as healthy as the original. Sorry, I just don’t like the sugar-free stuff. My name is Peggy, I am a sugar addict. 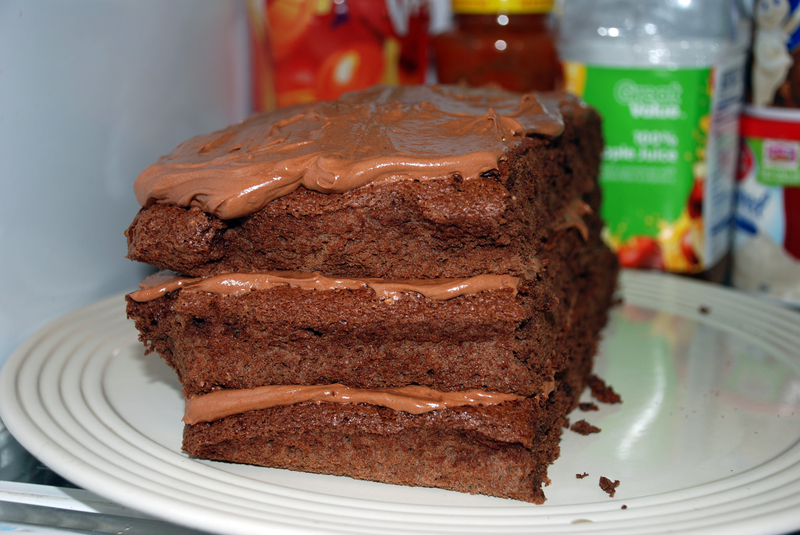 Here is the cake chilling in the refrigerator. We got busy with having fun with our guests, and I forgot to take a picture of the way we served the cake. I had some strawberries. We just fanned out a berry on each plate-just to look fancy. Lo and behold! The strawberries added a lot of yumminess to the cake. Maybe next time I will chop some up and add them with one of the layers. The recipe said that is serves 10. We cut 8 healthy slices the night we made it. There was enough for the four of us to go around again the next night. So, 12 servings! Here is a picture of the last piece of cake because I said, “Shoot, I didn’t take a picture of the cake!” You don’t get the full effect of the layers. Someone was ready to eat it. Chip: 5 stars–it’s WAY good! Megan: It’s smarter than the average cake! Katie: It was like a “dream” come true! 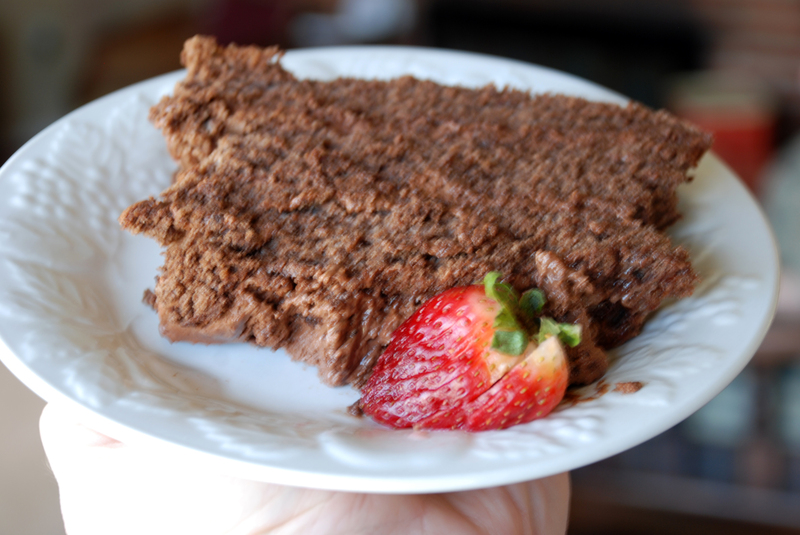 Guilt free chocolate cake! Guilt free anything! I will definitely try this one.